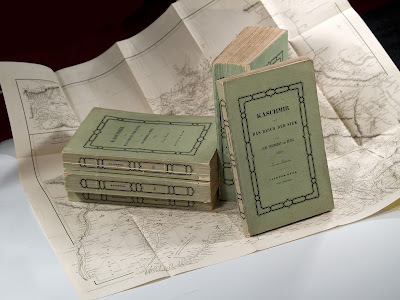 Musings of an antiquarian bookseller, including thoughts on books and people, descriptions of voyages and trips taken by famous and not so famous explorers or myself, and of course, the doings and sayings of Tante Trude. Several years ago I had a customer who occasionally bought an expensive book. He was not a regular, but sometimes came by to buy something, I think to reward himself for business deals that had gone well. He drove a flashy car, a Porsche that he was very proud of. He usually sprang out of it, wearing an Armani suit, an open white shirt and a gold chain around his fleshy, tanned neck. One day he arrived unannounced - looking distraught. I showed him several nice objects, and he finally took a 5-volume “Carl Freiherrn Hügels Kaschmir und das Reich der Siek …” He took it, not even bargaining about over the price. As I saw he was dying to tell someone, I cautiously asked about the reason for his agitated state of mind. I did, a breathtaking, slightly overweight blonde. “Poor girl, that is really terrible”, I commiserated. I agreed that this was probably the best, and that I thought it was very kind of him. I kept a straight face, packed his books into plastic bags, consoled him as best I could and then sent him on his miserable way. I was born in 1952, in Rüdesheim on the Rhine. In 1958, our family went to South Africa. After we had returned in 1968, I was indentured for three years as an apprentice at the Antiquariat Rudolf Habelt in Bonn, which specialized in old and rare books on archaeology and classic antiquity. After that, I went to London and worked for Foyle’s rare book department for 2 years. Then I worked in Hamburg at Dörling’s book auction house for 3 years. In 1982 I started working for the Brockhaus / Antiquarium, a rare book shop specialized in books on travel, geography and ethnography. I still work there, 30 years later. In case anyone is interested: No, I don’t collect books. They just sort of accumulate, like dust and memories.